This is a short update to thank you for your love, prayers and standing with us during our time of greatest need. As most of you know during these past three months, we have experienced fierce trials. Jesus has recently spoken to me about finishing well. I am fixing my eyes on Jesus. I am looking away to Him. I am coming forward with boldness to the throne of grace in my greatest time of need. Hebrews 4:1, "Let us therefore be diligent to enter that rest, lest anyone fall according to the same example of disobedience." In this time of reflecting, the Lord came to me and asked me, "If I had known ahead of time all that this calling would cost, would I still be willing to receive the call." And still my cry is yes. I have nowhere else to go. I have no one else to run to. Jesus is my life and He is altogether lovely. Through everything, it is still my joy to say that I gladly give my life for Him. 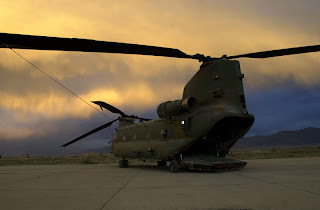 Today I went up in one of these, a Chinook. According to Wikipedia, the Boeing CH-47 Chinook is a versatile, twin-engine, tandem rotor heavy-lift helicopter. The counter-rotating rotors eliminate the need for an anti-torque vertical rotor, allowing all power to be used for lift and thrust. Its top speed of 170 knots (196 mph, 315 km/h) was faster than utility and attack helicopters of the 1960s and even many of today. Its primary roles include troop movement, artillery emplacement and battlefield resupply. There is a wide loading ramp at the rear of the fuselage and three external-cargo hooks. To me, it was just a big ole, loud, huge helicopter with a massive hole in the back. I sat in the very back there in the last seat where the hatch-y thing-a-madoodle drops down. (No, they wouldn't let me fly it and I knew better than to ask). So I had the best seat in the aircraft as I got to experience this awesome, unobstructed view. The weather was perfect, nice warm weather and not a cloud in the sky. I got to fly over what USA Today has titled one of the top 10 most beautiful places in America and a city that often ranks among the top 10 travel destination cities in America by Conde' Nast. 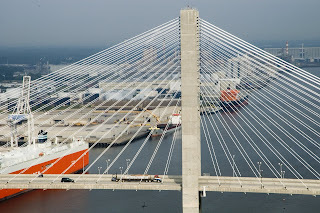 I got to fly right over the amazing and always breathtaking Talmadge Bridge, the 2nd largest port on the east coast, and over the beautiful lighthouse at Tybee Island. All this, with the wind in my hair and the sun on my face and neon yellow earplugs in my ears. It was all breathtaking and kinda surreal, as you are flying pretty low and just don't realize that all that is separating all of you from all of this is a seatbelt. You are right there, flying right over the bridges and the buildings, feeling as if you could reach out and touch them. 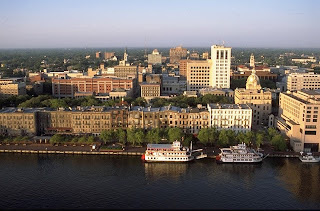 We flew over subdivisions, timber land, storage facilities, ball parks, power plants, the Elba Island Liquifiable Natural Gas facility, trailer parks, golf courses, Wal-Marts, manicured lawns, dirt yards, wetlands, drylands, streams, roads, universities, neighborhoods, resort hotels. It was so much to take in. I thought about it all. About how, the power plants sent electricity to the trailers and the country club. About all the cargo on all those ships, going onto all those trucks and trains. About the people on the planes and the Gulfstream jets being made beneath my feet, with their luxury leather and fine china inside. I thought about the kids playing on the baseball diamond down below and wondered how many had gotten bruised sliding into home plate. I wondered if the people in the big houses were happier than the people in the little ones. I wondered why Wal-Mart had to be full of so much junk and why we needed so much stuff. I wondered about the science behind liquifiable natural gas and wondered about the men down their researching it and its future. I wondered about the dolphins off shore at Tybee and hoped one would surface, just for me. I wondered how many people worked their entire lives to be able to build one of those little bungalows down below. I wondered a lot of stuff. Maybe it was the coffee with the amazing spinach omelet I had for breakfast, or maybe this is just the way I am. But my mind raced. It raced at the awesomeness and the vastness and the enormity of LIFE!! It's huge! It's bigger than we can ever know. Physically, I can only really know what is going on within...maybe 100 yards of me at any given time. But an aerial view, woah, it'll blow you away. It is chaos, but completely organized at the same time. The traffic, the people, the boats, the tides, it all flows, we flow. There was a beauty to the rhythm of it all. It was constant entertainment to watch the cars and see their destination, to watch the boats and know where they were going and even see the little pilot boat awaiting their arrival. It made me feel empowered as I could see so much of my surroundings. I didn't like being back on ground where I could only see what was simply right in front of me. I wanted to see my future and even all of that behind me, where I had been and what might be following me. I liked the aerial view. How cool that the Creator of the universe and you and me has a 24/7 aerial view?! He sees everything! He has this amazing view of our lives in every aspect. He sees our little houses we struggle to keep tidy and in order, our yards we sweat (or pay someone else to sweat) over, he sees our destination before we arrive. Even better, He sees inside, and he knows our hearts, our deepest desires, our wishes, our hopes, what makes us happy, even what just makes us smile. He sees us sleep and wake. He sees our laughter and our tears. He even hears us when we speak and when we pray, and even knows our thoughts...before we even think them. He subtracts the numbers of hairs from my head as I stand in the bathroom, blow-drying my hair. He knows where I am going in my life, with my career and my relationships. He knows everything about us and he holds our future in His hands. He looks down at us and He loves us because He created us to worship Him, to commune with Him, to talk to Him, to seek Him. So since He has the aerial view, I wanna know what He sees up ahead. What is in my future? What does it hold? So if He sees my future and wants the best for me because I am His child, I want to seek Him in every step I take as I am going there. He knows where traffic is stopped and the quicker route. He knows where there is danger ahead and can show me a safe way. Cool, huh? 9God didn't put angels in charge of this business of salvation that we're dealing with here. It says in Scripture, What is man and woman that you bother with them; why take a second look their way? You made them not quite as high as angels, bright with Eden's dawn light; Then you put them in charge of your entire handcrafted world.When God put them in charge of everything, nothing was excluded. But we don't see it yet, don't see everything under human jurisdiction. What we do see is Jesus, made "not quite as high as angels," and then, through the experience of death, crowned so much higher than any angel, with a glory "bright with Eden's dawn light." In that death, by God's grace, he fully experienced death in every person's place. He is so bigger than you think. And He created US to be in charge of His handcrafted world. He wants us to delight in it, enjoy it, and take care of it. And we are His, to delight in, enjoy and take care of. He has a spectacular view of you and your life. I don't ever want to make a choice based on my little view here on earth, from 5'4" above the ground. I want to trust in the Creator as He looks over all of creation, galaxies and the universe, and yet He sees...me.